Wedding toasts and receptions are perfect for Island Orchard Ciders Normandy style ciders. Your guests will enjoy these refreshing ciders which are not too sweet and pair beautifully with your special dishes. Our ciders drink like wines but they have half the alcohol content and are not as heavy as a beer. Plus, they are gluten free! Island Orchard Ciders are produced from Door County apples grown at our Washington Island orchard and from other local growers. In 2006 we planted 36 types of American, French and English apple trees. Taste these award winning ciders at our Door County Cider House located on the peninsula in Ellison Bay, which is 5 miles north of Sister Bay. 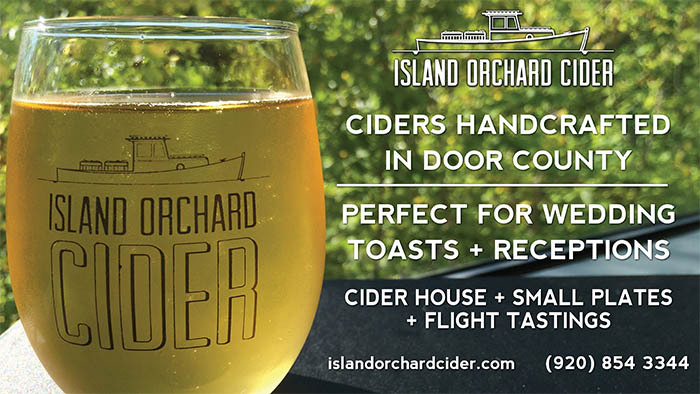 Come visit our Door County Cider House with flight tastings, small plates, and full pours of your favorite cider . Open April thru December. April-5/19 F-Su 12-6pm, 5/24-10/28 daily 12-6pm*, *June-Aug F-Sa 12-8pm. Nov -Dec 22 F-Sa 12-5. Closed Dec 23-Mar. All ciders are GLUTEN FREE! We specialize in a Normandy Style Cider. Our family produces a handcrafted traditional French cider, which has a lighter texture and is more wine-like. The ciders are dry, crisp and refreshing; richly complex with fruit, natural tannins, sugars and higher acidity. These all come together to create a cider that pairs deliciously with all types of food. The cider apples are grown at our orchard on Washington Island. By slowly planting cider cultivars from France, England and America, we tested the types of apples that would work best with the island’s climate and rocky limestone soil. We grow 30 apple cultivars from sharps to bitter-sharps to dessert apples, 10 varieties of pear, totaling in 2000 apple and 400 pear trees. Come visit our Door County Cider House. Enjoy a flight tasting, or a full glass of your favorite variety, and see where the handcrafted cider is fermented and bottled.